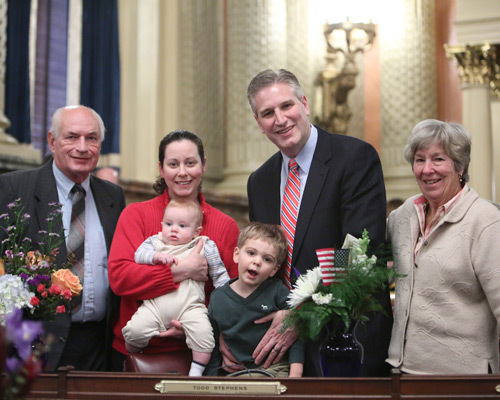 Rep. Todd Stephens with his family before taking the oath of office for the 2015-16 House session. HARRISBURG-- Rep. Todd Stephens (R-Montgomery) was sworn in today to his third term in the Pennsylvania House of Representatives. During the last legislative session, Stephens had several measures signed into law including legislation reforming Pennsylvania’s child protection system by expanding the list of those required to report suspected child abuse and increasing the penalties for failing to do so and legislation protecting victims of domestic violence and those needing intervention or emergency assistance from penalties for calling 911 as occurred in Norristown, Montgomery County. He also fought to bring greater state funding to the schools of the 151st District, which receive a smaller percentage of their funding from the state than almost all other school districts in the Commonwealth. You can follow Stephens throughout the term on his website at www.RepToddStephens.com and on Facebook at www.Facebook.com/RepToddStephens. His district office is located at 515 Stump Road in North Wales.